Maeva! Welcome to your perfect romantic getaway. 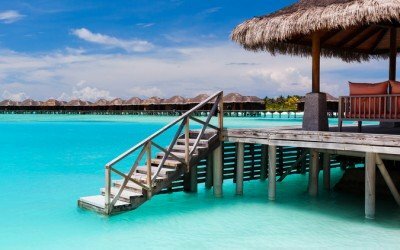 If your dreams are painted with strokes of turquoise, aqua and jade, and are redolent with warm tropical breezes, aromatic leis and whispers of French, then a romantic escape to Tahiti will make your dreams a reality. Jan Mauer is a certified Tahiti Specialist who is quite literally an expert in planning your French Polynesia getaway. 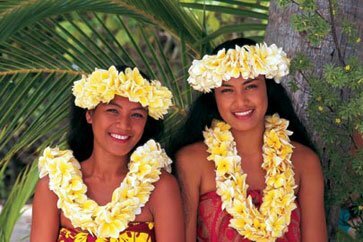 She has personally visited Tahiti four times and is ready to help you create your own customized luxury Tahiti vacation. 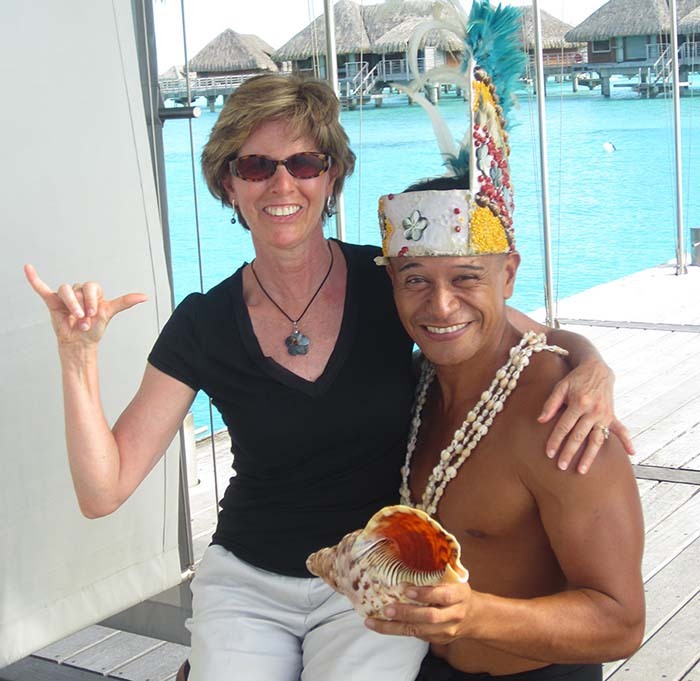 Contact Jan to Plan Your Luxury Tahiti Vacation! View the brief welcome video from Tahiti Tourisme North America, and discover the beauty of this island paradise. Click here to download a taste of Tahiti now. Whether it’s a couple’s vacation, an anniversary getaway or a honeymoon celebration, exotic French Polynesia is a romantic paradise. 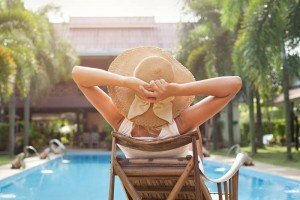 Its unspoiled natural beauty, secluded beaches, and luxurious, unique accommodations make the perfect adult escape any time of year. .Thank you again for ALL the time and work you put into our vacation in Paradise… All your planning made for everything to go so smoothly. The island of Tahiti is home to the majority of its residents, as well as the capital, Papeete. Bora Bora is perhaps the most popular island and deservedly so… striking emerald mountain peaks jutting from calm turquoise waters paint a quintessentially South Pacific picture, with its dramatic and alluring contrasts seducing visitors from around the world. Your Exciting Vacation to Tahiti will be customized to suit your every need and desire. If you enjoy diving or snorkeling, Tahiti’s crystalline water and abundant sea life always enchant and delight. Feeling a bit more adventurous? Join the reef sharks for breakfast or take an afternoon swim with manta rays. For those who prefer more relaxing moments, a day spent lounging on the powdery sands of an isolated motu (tiny island) or a romantic couples’ massage at one of Tahiti’s world-class spas will ensure your escape from reality is complete. The people and cuisine of Tahiti are just as spectacular and inviting as its scenery. Each morning you will be warmly welcomed with a melodious “Ia Ora Na” (pronounced yo-rah-na) and every meal will tantalize with a fresh, delicious fusion of French, Chinese, and Polynesian cuisine. On Bora Bora, a visit to world-famous Bloody Mary’s is a must, where you’ll dine on freshly caught fish while sipping a Bloody Mary (of course!) with your toes in the sand. Your evenings will be filled with the sounds of the tropics—perhaps the sweet strands of traditional yukele music while strolling along the beach or simply the gentle lapping of water beneath your private villa as you gaze up at an unencumbered, sparkling sky. 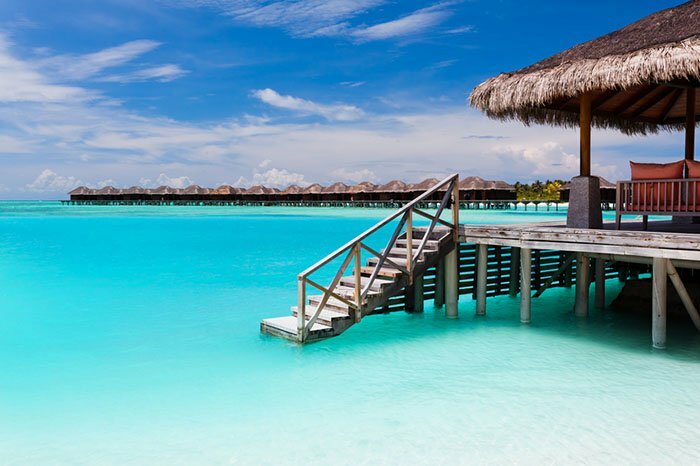 Did you know the overwater bungalow originated in Tahiti? Exciting Vacations will ensure your accommodations in French Polynesia are as unique and luxurious as the setting. 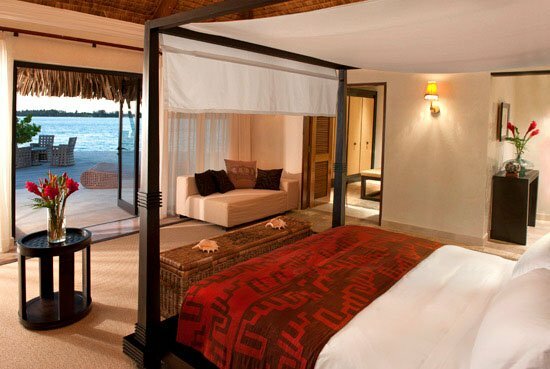 After an unforgettable day, you’ll retire to a thatched-roof overwater villa or a private bungalow. Your nights will be filled with all the amenities of a first-class resort, including “Tahitian TV”—a glass floor providing an awe-inspiring opportunity to gaze at the colorful fish and flora from the comfort of your room. In the morning, enjoy breakfast in the sunshine of your private balcony and savor fresh fruits and pastries delivered to you by canoe. 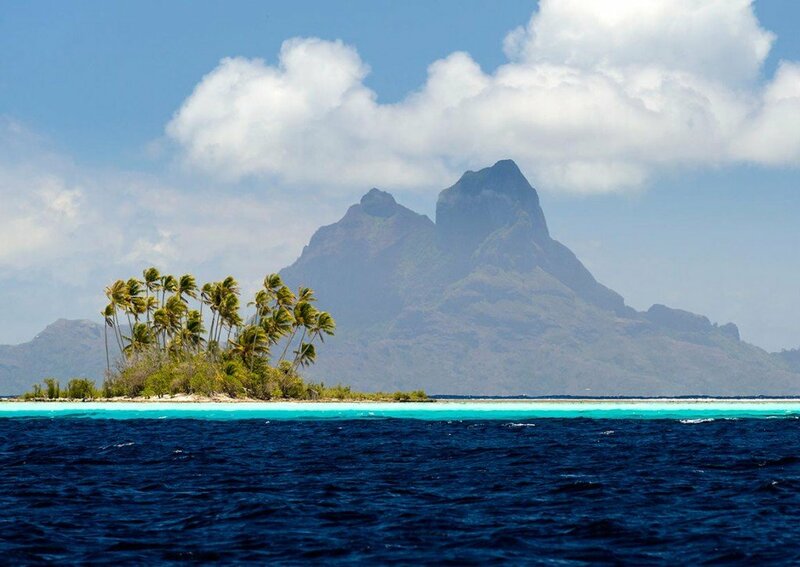 you may enjoy on an Exciting Vacation to Tahiti. 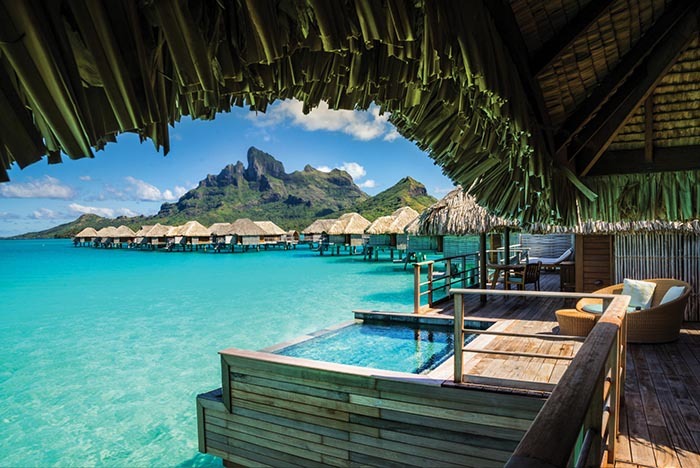 At St. Regis Resort, Bora Bora, guests will reside in a private villa and experience bespoke service on one of the most beautiful and romantic islands, set amidst endless tropical waters. From the Oasis Pool, to the central pool with a swim-up bar, to the saltwater private lagoon full of native fish and stingrays — dive into the many pleasures of paradise. 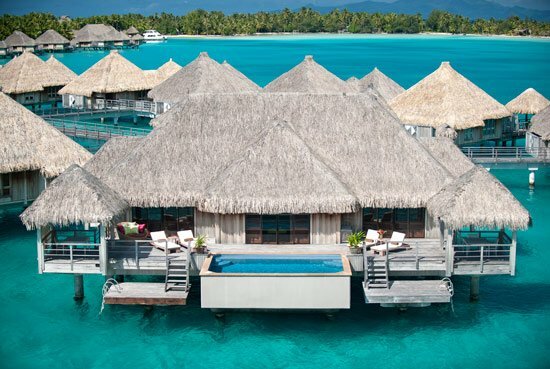 Escape to spacious hideaways nestled around Bora Bora lagoon and its outer beaches. Over-water bungalows are perched on stilts above the turquoise lagoon and welcome you with traditional teak furnishings, high ceilings and roofs thatched with pandanus leaves. On-shore spacious villas stretch along a semi-private pristine beach and include the luxury of your own private pool. Enjoy stunning views of the emerald waters and majestic Mount Otemanu no matter which well-appointed accommodation you select. 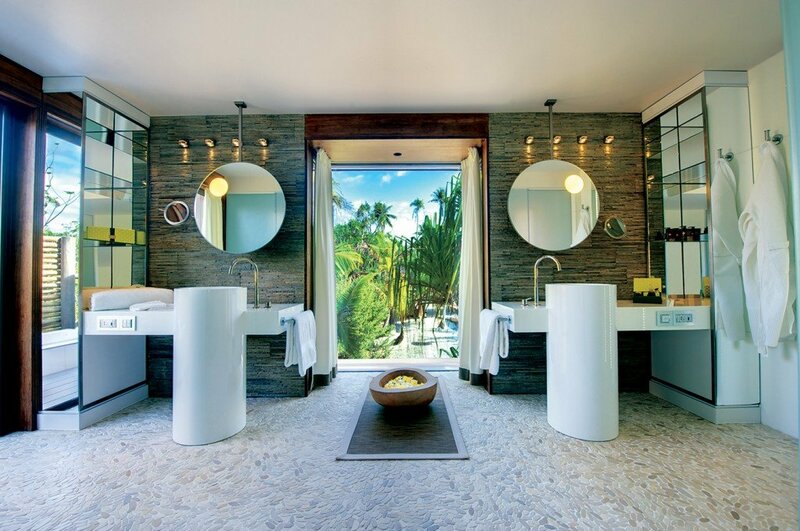 Le Tahaa Island Resort and Spa is designed to be the most exclusive resort in French Polynesia. Superbly located on Motu Tautau on the coral reef, the resort faces the island of Taha’a on the lagoon side and offers an unsurpassed view of Bora Bora. The resort offers 48 Over Water Suites and 12 Beach Suites measuring more than a hundred square meters in size. The public areas are built in the trees, providing an exquisite view on the lagoon and Taha’a Island. The Brando is the latest entrée into luxury Tahitian resorts, a brilliant gem set on French Polynesia’s breathtakingly beautiful atoll of Tetiaroa. With access to the atoll by a 20-minute private plane flight from Tahiti, this all-inclusive resort features 35 secluded villas with private pools on beautiful white-sand beaches frequented by sea turtles and exotic birds. Nestled between two bays on the heart-shaped island of Moorea, just 17 kilometers across the Sea of Moons from Tahiti’s capital, Papeete, the Hilton Moorea Lagoon Resort & Spa is set against a stunning mountain backdrop that melts into a crystal clear lagoon. Featuring contemporary Polynesian design, this Moorea resort’s luxurious bungalows are either surrounded by exotic flower gardens or suspended above the turquoise lagoon, teeming with tropical marine life. A Tahiti vacation is closer than you think — only eight hours from Los Angeles or about twelve from New York. Let Jan Mauer customize your trip from start to finish. As a Tahiti Specialist with Virtuoso affiliation, she only works with premier travel companies to ensure your trip to paradise is second to none. Contact Jan now to start planning your romantic Tahitian getaway.